1. A fully functioning fire extinguisher that looks like a bottle of wine so you can at least get a *little* excited about making such an adult and responsible purchase. Get it from Safe-T on Ahalife for $99.99. 2. 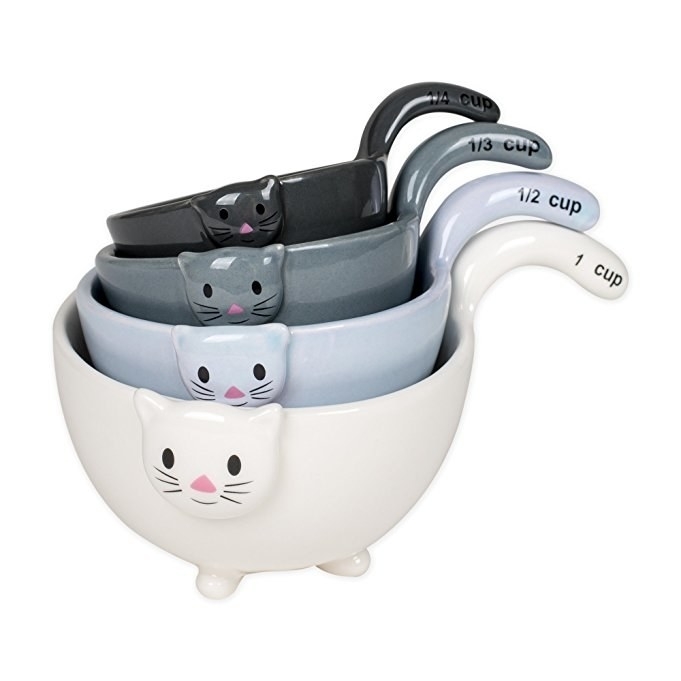 A set of cat or googly-eyed measuring cups so you can stop eyeballing it and get purr-cise. 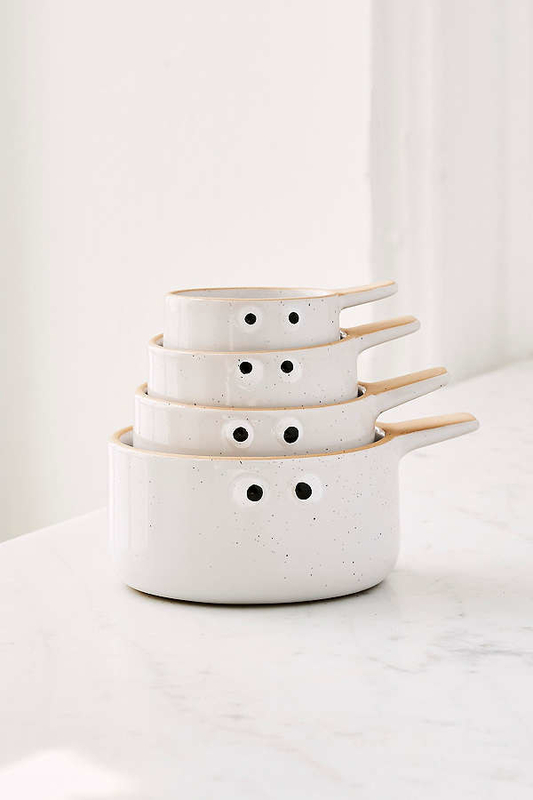 Each set comes with four cups: one cup, 1/2 cup, 1/3 cup, and 1/4 cup. Get the cats from Amazon for $34.95 or googly eyes from Urban Outfitters for $24. 3. A pair of adorable dryer balls that help your clothes come out fluffy and wrinkle-free. Get two from Amazon for $8.95 (also available in puffer fish or hedgehogs). 4. A wooden cheese board you don't want to brie without. 5. A llama duster that's going to make you want to clean all the time. Get it from Amazon for $15, Walmart for $14.95, or Urban Outfitters for $15. 6. A unicorn teapot for getting a magical cuppa — no microwave needed. No need to put any more Aussies in anguish now that you have an actual teapot. Get it from Firebox for $39.39. 7. 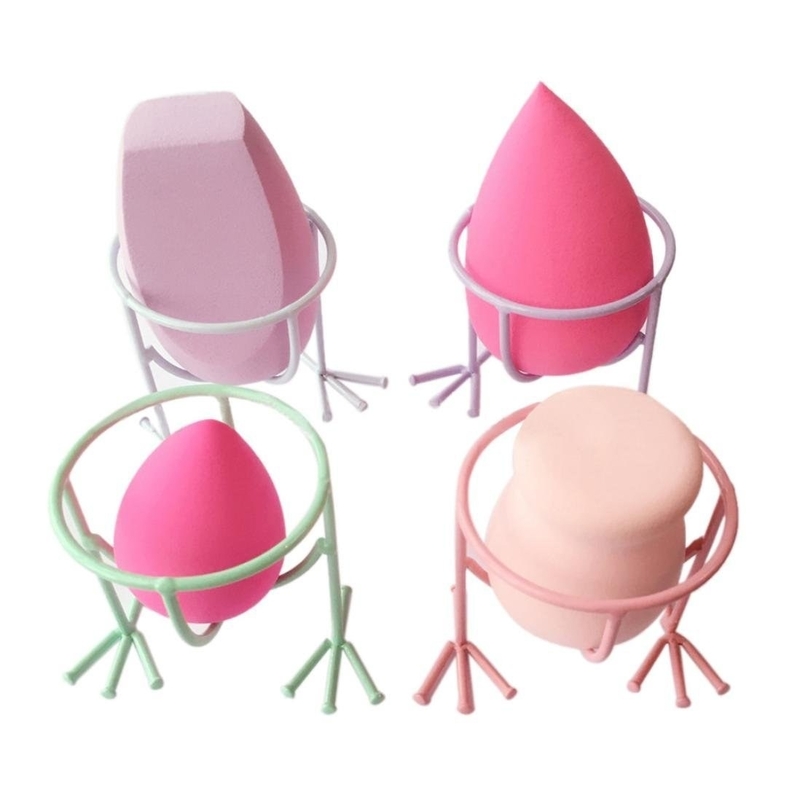 A non-electric humidifier ironically shaped like a cactus for a room that's anything but arid. You don't need to plug this humidifier in — just pour in water and let it evaporate through the felt folds of the cactus. It has an antibacterial coating so it won't get moldy. Get it from Walmart for $9.88 or Bed Bath and Beyond for $19.99. 8. 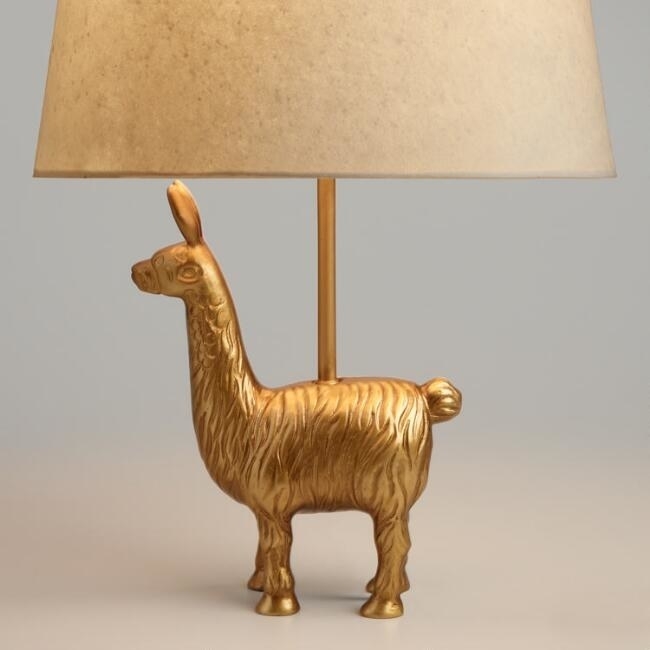 An elephant or llama table lamp for an illuminating lesson that ~anything~ can be adorable. 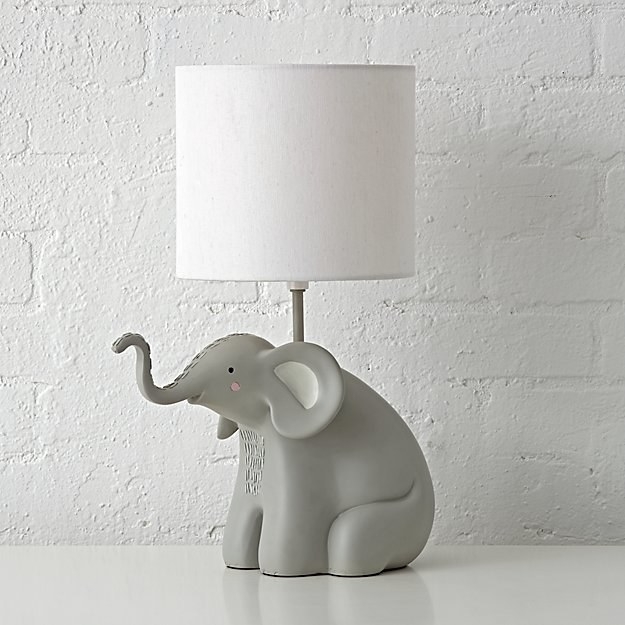 Get the elephant from Land of Nod for $79 or the llama from World Market for $21.74. 9. A little bird water globe so efficient at watering your plants, you'll want to sing about it. 10. 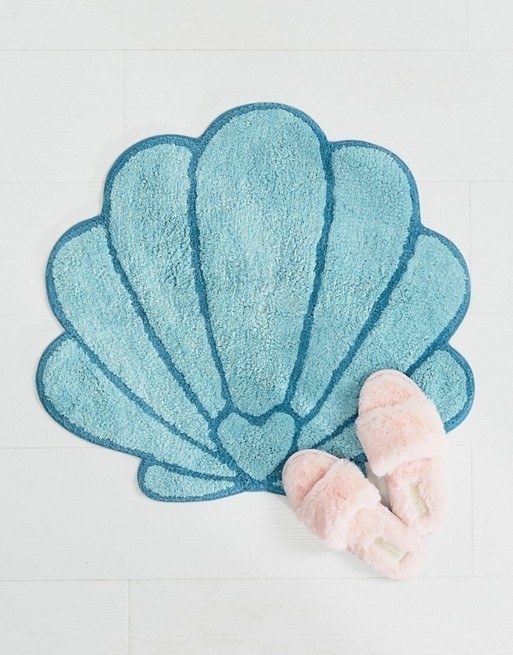 A seashell or cat bath mat for a pawwsitively amazing bathroom you have to sea to believe. 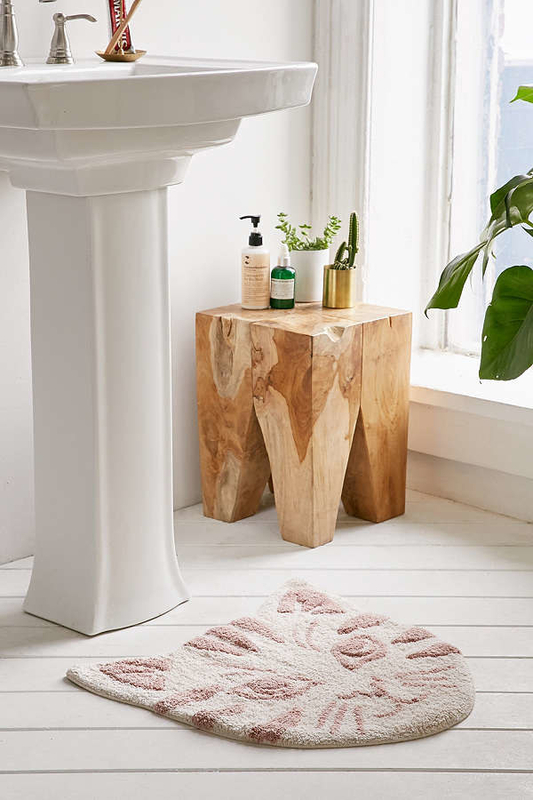 Get the seashell from Asos for $21 or the cat from Urban Outfitters for $24. 11. A pineapple shower pocket that clings to the wall for people who like to brush their teeth in the shower. There are holes in the bottom for proper water drainage. Get it from Urban Outfitters for $18 or the Container Store for $12.99. 12. An animal sink strainer cute enough to make the process of getting food debris out of the sink more e-fish-ent. Get it from Amazon for $5.37+ (available in six animals). 13. 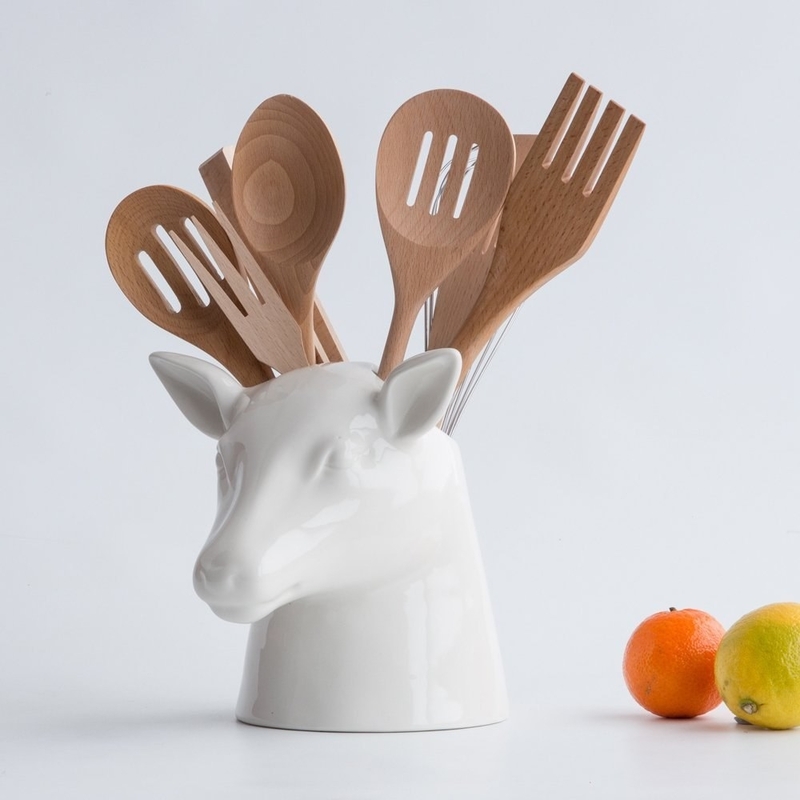 A deer utensil holder that transforms your spoons and whisks into a luxurious rack of antlers. 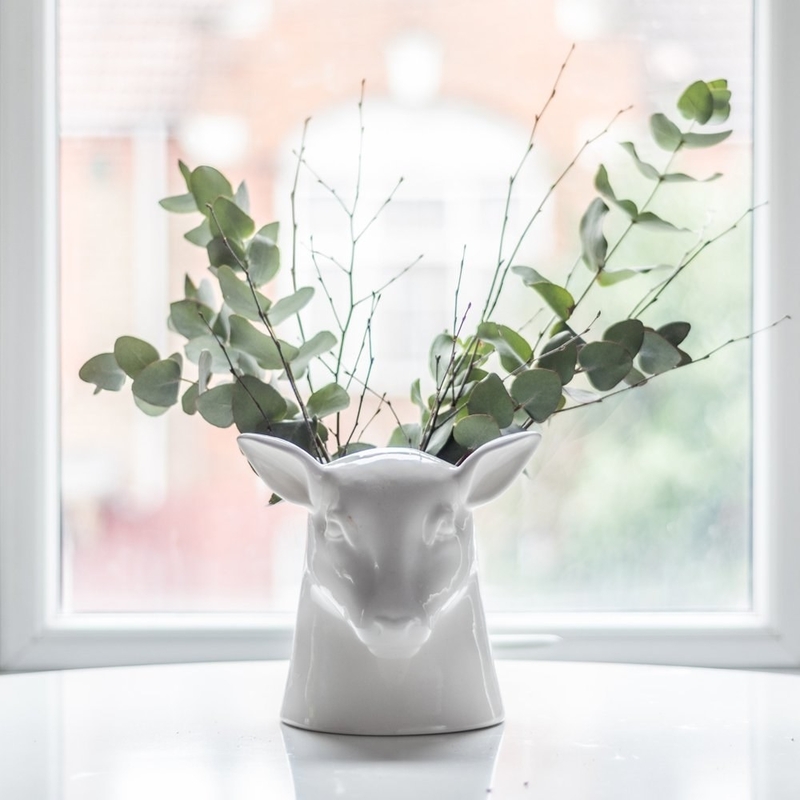 You can also fill it with pencils, pasta, flowers, branches, or anything else vaguely antler-like. Get it from Asos for $48 or Amazon for $55.22. 14. A pair of happy spatulas to match all the smiling breakfasts you're about to make. Get two from Urban Outfitters for $10. 15. 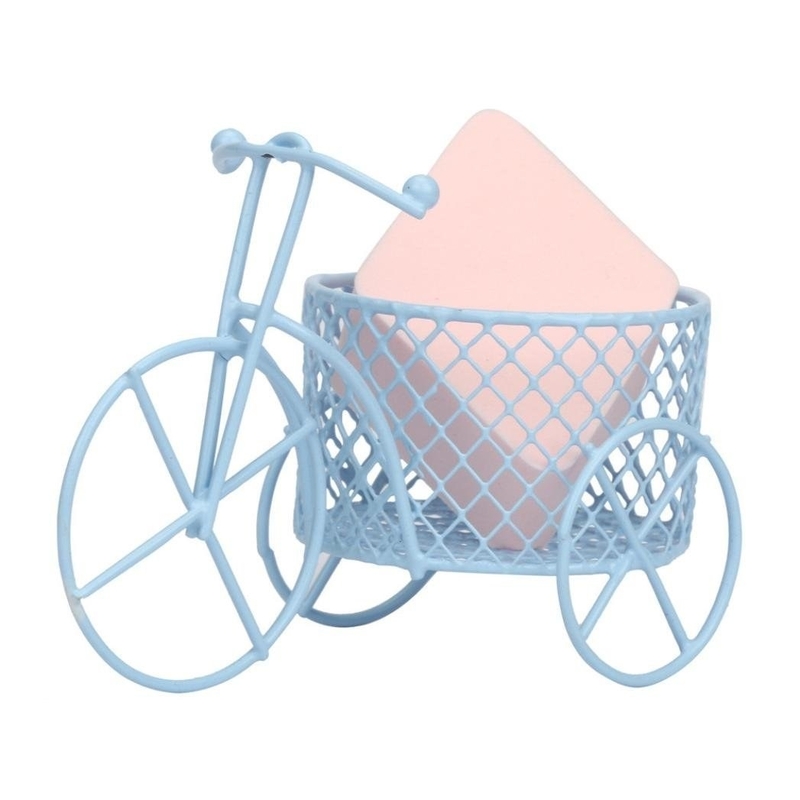 A chicken leg or bicycle makeup sponge holder that you didn't even know you needed. Both come in a randomly selected color. Get the chicken legs from Amazon for $1.68 or the bicycle for $1.99. 16. A furry ottoman to rest your barking (sheep) dogs. 17. A pair of toucan scissors that will help you fly through all your coupon clipping. The beak sleeve has a magnet so you can keep it on your fridge. Get it from Amazon for $9.29, Walmart for $13.79, or Modcloth for $9.99. 18. A yellow submarine contact case at an un-Beatle-ble price. 19. A cat food dish that your egotistical pet will really enjoy looking at. 20. A nail brush you'll have a whale of a time using. You get one randomly selected whale in white, light blue, or dark blue. 21. A penguin-shaped ice pack to make taking lunch to work a lot cooler. 22. A clever ladle that looks like a little baby Loch Ness monster swimming in your soup. 23. A little ravioli you can rest your spoon on while you're cooking the real deal. Get it from Amazon for $12.45 or Modcloth for $9.99 (get the heart spoon here). 24. A fake bearskin rug trivet for sensually laying down your hottest dishes. 25. A 12-pack of mini emery boards perfect for any sloth lover. Get a pack of 12 from Paper Source for $2.95. 26. A five-cord-in-one USB charger probably invented by Carebears so all devices can get some power. 27. A pair of cat bookends for keeping all your feline literature together. Among the collection: The Great Catsby, The Caterpurry Tails, The Sound and the Purring, and The Cat in the Hat. 28. An otter tape dispenser you'll want to hang on to once gift-giving season is upon us. Get it from Amazon for $13.34 or Modcloth for $14.99. 29. A helpful pup that'll keep your door open (or closed). Get it from Amazon for $12.88 (available in two breeds).